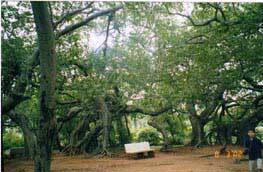 The banyan tree has legendary mythological and cultural significance in India. If you are contemplating a good travel destination, going to see an old tree would definitely classify a curious one. May be not to a tree expert, or a naturalist or even a historian, but ordinary tourist travelling a good 103 kms from the city limits to view of all the things, a tree? This is precisely what my family and I did when we visited India last summer. I have often heard that the oldest and world famous Banyan trees are found in India and the one that I intended to visit was close to Mahbubnagar, a town in Andhra Pradesh, around 103 kms away from Hyderabad. It was a hot Saturday morning in July with temperature hovering at 40 degrees C when we set out. The air is thick with dust and heat as our driver maneuvers the city traffic that follow its own rules of the road and speeds his way out of the city limits. One of the major means of communication in Indian transportation is the horn. In America, only cities like New York share this special privilege, but in India it is almost your birthright and a vital test of your driving skills. Needless to say, our driver used it skillfully and sometimes annoyingly, making no allowance for our eardrums. To reach this famous banyan tree, we had to take a small detour from the city of Mahbunagar. The tree is called Pillalamarri. Pillalu means children and Marri means Banyan tree in Telugu. The tree is more than 700 years old and it covers an area of 3 acres. We drove down an uneven road in the dusty countryside in the blistering hot sun. There are few signs leading to this place. So you have to constantly stop and ask one of the roadside stalls the directions to Pillalamari. We reached at almost noon time and it was mostly quiet here, with very few visitors and an occasional call of a chirpy bird and the sound of the whiff of wind that came as a respite form the hot sun. The path opened up at an eroded spot beneath a grove of trees that had an enclosing around it. From that vantage point, we stopped there to gulp down some water and enjoy the gentle winds gusts that swept across. After the short respite, we walked through the canopy marveling at the beauty of this single tree that seemed so monumental. Where did it begin and where did it end? We had no clue. It was an amazing sight to see the branches touch the earth almost as if in obeisance and shoot toward the sky the next moment. Dried needles from the trees carpeted the ground, cushioning our feet. There were barely one or two people around, and an old village lady walked up to us and acted as an impromptu guide. Speaking in the local dialect. which had a hard time grasping, we nevertheless learnt that the tree had a legend behind it, which gave it its name. We walked under this sunlight-shielding canopy of trees and vegetation. At one spot, a shrine of a Muslim saint sits in the shadow of the huge banyan tree with vines intertwined so tightly that they appear like the kind of thick rope used to secure ships. You are transported to Rudyard Kipling’s Mowgli tales, swinging through branches. It is believed that this area alone can accommodate as many as 1,000 people. From my research, I found out the Banyan tree (Ficus Bengalensis) has a remarkable method of growth. As it puts down roots, the trunk shoots up and branches spread out. The branches stretch and bend almost touching the ground. These then grow into the ground to become roots. Roots then pump sap up and act as support and again strut out branches. In this way it keeps growing outward and the tree expands to form a small wood or even a forest under its massive canopy or umbrella. The host tree almost loses its identity as the banyan sends out roots and branches. It is said that a mature Banyan’s canopy can cover more than 1,000 feet in diameter. The banyan also has legendary, mythological and cultural significance in many cultures. So it is in India. I remember as a young child visiting temples and often finding rest and shade under its huge Boughs. In Hindu mythology, the tree is called Kalpavriksha, the tree that fulfill all your wishes. It is also called Bhaupada, the one with several feet or many footed one. And of course our various mythological tales and religious texts talk about how many Hindu sages and as well Buddhist monks have sought the meaning of life and attained nirvana under the Banyan tree. The most popular and delightful folk tale is the one of the three good friends, a monkey, an elephant and a partridge who lived under the great banyan tree in the Himalayas. After living in a world of chaos they decide they needed a leader and the partridge emerged the winner. How? His answer to the question on how well he knew the banyan tree was “”long ago there grew another great banyan tree far from here. I used to eat the fruits of that great tree. It was I who carried seeds to this spot and left them here in my droppings. From one of those seeds, this great tree grew. I knew this tree before it was born!” The other two were convinced and so they all sang Bishop Heber (1825) was so impressed by the sight of this tree that he exclaimed: “What a noble place of worship”. Travelers’ tales even inspired the great English poet Milton to give description of the banyan tree in Paradise Lost in the following lines. Standing under the banyan tree at that moment, I could feel the echo of his words.